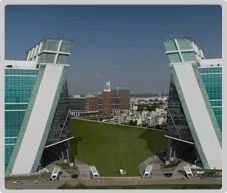 DLF presents its mirror of corporate success - 9A and 9B, LEED Gold Certified buildings, in DLF Cybercity. The elegant twintower edifice offers the best that is found in contemporary structures across the world. The spectacular complex presents a plethora of futuristic amenities, which together more than meet the demands that an efficient and inspiring work environment asks for. 9A and 9B are perfectly located in between Forum and DLF Cyber Greens, just off the national highway (NH-8) in Gurugram, and in close proximity to the international airport. What you get is the convenience of a central business location along with advantage of Gurugram’s most exclusive business address. The majestic towers of 1.51 mn sq. ft. spread over two independent buildings comprise of 17 floors each (Ground + 16). The mirrored tower designs offer new generation workspace to corporates, software majors and IT- enabled service companies who are used to jet-setting, global lifestyle. The design incorporates large, efficient floor plates, a wide column span and high floor-to-floor clearance, allowing for optimal space utilization. From the stunning foyer to the state-of-the-art amenities and ambience, you’ll find a sophisticated design language beackoning to you from every aspect.